Running on Pixie Dust: A Very Disney Halloween! I've always enjoyed Halloween. 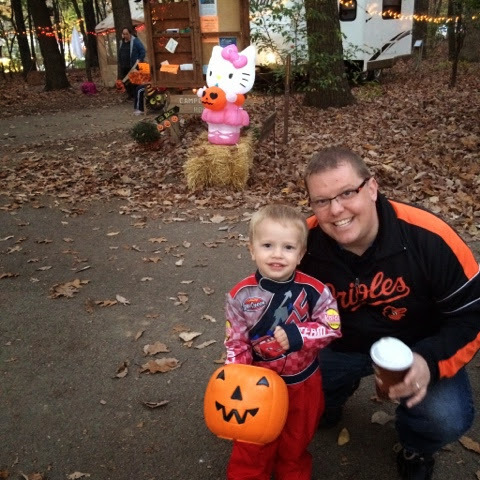 The mix of pumpkins, apples, corn mazes, hayrides, leaves changing, and cooler weather is simply wonderful! Halloween also means that we get a chance to celebrate the spooky while becoming our favorite characters. I've fallen even more in love with fall this year. This is the first Halloween that Brody has really caught the spirit and it's been fun to experience with him! Of course, Disney is at the center of this celebration for our family too!! Brody and Dan visited a pumpkin patch and picked out several to bring home. 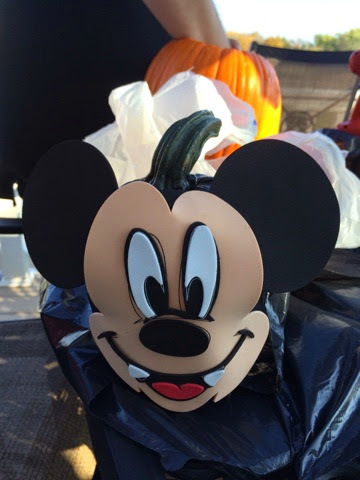 Since Brody is too little to help carve a pumpkin yet, I bought him a Mickey pumpkin decorating kit with paint and foam pieces that he could put together. 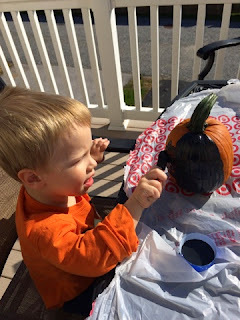 He had such a great time designing his Mickey pumpkin! And when it came to picking a Halloween costume, Brody had his choice for the first time. I showed him pictures of lots choices and he picked to be Lightning McQueen's driver. Brody loves all things cars - the faster the better - and was so excited to see his costume arrive. We trick-or-treated at Codorus State Park during their Halloween in the Park event this weekend before the big night this coming week. I think he made a great race car driver! Seeing Brody's excitement about Halloween has me really looking forward to next year too. 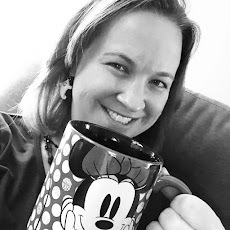 We are planning a trip next Fall to WDW with my parents and should be there for Mickey's Not So Scary Halloween Party. I've never been before but have a wonderful feeling that our family is going to love it!